Corporate America produced another outstanding earnings season. We expected another quarter of strong earnings growth, and corporate America delivered even more than we anticipated. Revenue and earnings upside compared with expectations was particularly impressive, making prior assertions of an earnings growth peak premature. We have also been impressed by the resilience of companies’ outlooks in the face of tariffs and ongoing trade policy uncertainty, as we discuss in this week’s Weekly Market Commentary. Looking ahead, guidance was generally positive despite tariffs and ongoing trade policy uncertainty, with most companies taking a wait and see approach. By the numbers. S&P 500 Index earnings rose 28% year over year in the third quarter, exceeding the second quarter’s 25% pace while outpacing estimates by more than 6 percentage points, according to Thomson Reuters’ data. Index earnings have now grown at double-digit rates in six of the past seven quarters. A solid 78% of companies exceeded earnings targets, while the revenue beat rate is 61%, both above long-term averages. Even when excluding the impact of the new tax law, we estimate S&P 500 earnings growth came in at around 20%. Since quarter end, S&P 500 earnings per share estimates for the next four quarters have fallen by 1.1%, better than the long-term historical average reduction of roughly 2%. Capex’s cooling. Capital expenditures (capex) have grown solidly over the past two years, until recently. Over the past few months, trade tensions have hindered the promising improvement in business spending as input costs have risen, supply chain disruptions have created new challenges, and the corporate world has braced for uncertainty. In this week’s Weekly Economic Commentary, due out later today, we examine the recent slowdown in capex growth, and highlight our thoughts on what could spur a rebound in spending. Another sign of a strong economy. The Conference Board’s Leading Economic Index (LEI) is one of our favorite economic indicators. Last month it came in slightly above September and up 5.9% year-over-year (YoY). The seven recessions since the early ’70s all saw the LEI go negative YoY an average of eight months before the eventual recession. Today on the LPL Research blog we will take a closer look at why the LEI is showing there is still plenty of time left in this economic cycle. Week ahead. Key events to monitor include a speech by Federal Reserve (Fed) chair Jerome Powell on Wednesday and the G20 meeting in Buenos Aries, during which President Donald Trump and Premier Xi Jinping are expected to discuss the ongoing trade tensions. Expectations for a resolution remain relatively low; however, even a “cease fire” would likely be a welcome revelation. On the economic front, traders will get several sets of key data this week as the S&P 500 looks to bounce back from last week’s 2.5% loss. Among the U.S. reports to monitor are the Consumer Confidence Index, which remains near cycle highs, the core Personal Consumption Expenditures-the Fed’s preferred inflation measure-and several reports on the housing market. Overseas, Purchasing Managers’ Index data for Japan and China will be on the radar, along with a read on consumer confidence and inflation out of the Eurozone. 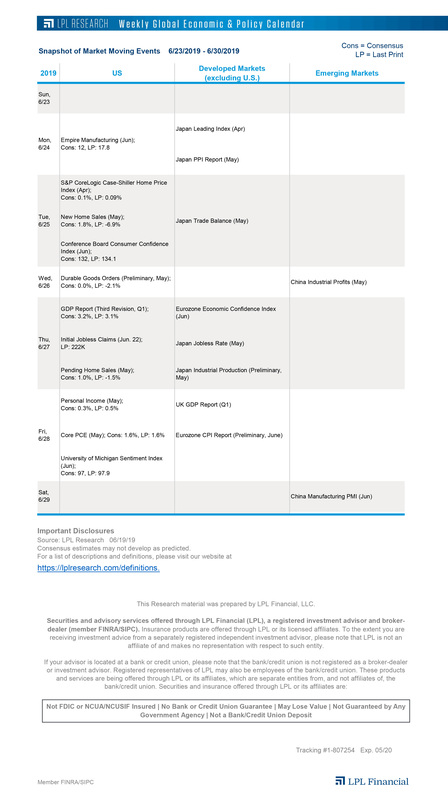 Track these and other important events on our Weekly Global Economic & Policy Calendar.